All cottages have magnificent views. All cottages flow out onto private patios. All cottages are north-facing. (Cool in summer and sunny in winter.) For the colder winter months, most rooms are equipped with under floor heating. Each cottage is equipped with its own kitchenette. Each cottage has its own Private lounge Lots of privacy. Several BBQ areas available. There is DSTV and CD player in each cottage, with an extensive collection of CD's available on loan for guests. Undercover and safe, off-street parking. 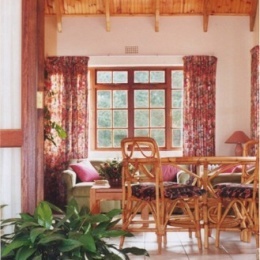 The accommodation at Karrad is ideal for tourists, whether travelling alone, as a family or in a small group. 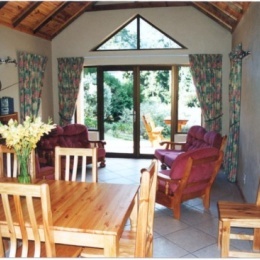 Our Cottages offer you luxurious and spacious self catering accommodation. Ample play areas for children, safely enclosed. A setting on a mountainside smallholding with an enchanting indigenous garden. Hout Bay is ideally situated as a base for tourists. It is within comfortable travelling distance of all the main tourist attractions in Cape Town.